1) The first way, of course, is to purchase the live feeds so you can tune in whenever you want during the season. Post by Big Brother Buddy. 2) The second way (you might have guessed) is to use the Big Brother Buddy app (iPhone/Android). Our (free) app is now all ready for Season 16, available in your favorite app store. If you have never used the app before, the main draw is that it provides real-time push notifications for important events. This is especially useful on those beautiful Saturday's where the feeds are blacked out for the majority of the day while things like POV competitions are being held. 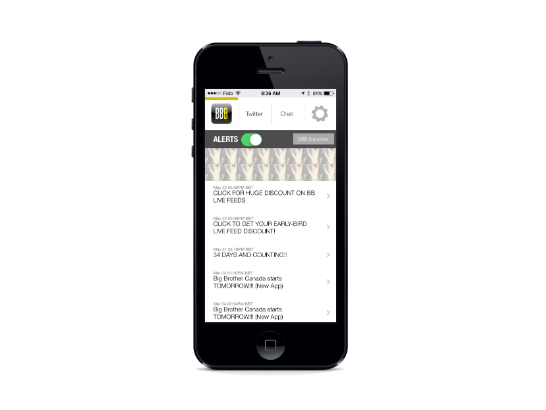 With our push notifications, you will get information about what happened pushed directly and immediately to your phone with all the details, the instant we can determine what happened. Go enjoy your Saturday! Leading up to the premiere, we have made our Season 16 in-app upgrade $1.99 (reg. $2.99). This optional upgrade will remove the ads in our app, enable chat, and give you real-time houseguest status information. All proceeds from BBB supporters go toward making our service better, and building the community.